SubZero's 60-watter is an ideal combo for the acoustic player who wants total control over their sound, whatever the gigging scenario. Clear, balanced sound, with flexibility for tweaking. Good range of volume, EQ and effects. Reverb can get a little fizzy at higher levels, and isn't available on mic channel. Bass will need taming at louder volumes. The quintessential vision of a true acoustic troubadour is one musician and their guitar. Unfortunately, if that particular singer-songwriter wants to be heard in a venue larger than their living room, they'll need some amplification. It's all well and good turning up and hoping there's a PA to play your acoustic anthems through, but you can't always rely on one being there. Enter the SubZero 60W Acoustic Guitar Amp. This rather sharp-looking, well-constructed combo has enough power to carry your sound across a packed club, while two inputs enable you to plug in both an electro-acoustic guitar and a microphone. A 3.5mm auxiliary-in jack for your mp3 player also makes this amp ideal for use with backing tracks, whether that's on stage or practising at home. For enhanced live polish, SubZero has included three acoustic-orientated effects, chorus, delay and reverb, which should lend a professional sheen to your sound. There's also a phase switch, which is designed to prevent the feedback issues that often plague gigging acoustic guitarists. Standard gain and EQ controls on both guitar and mic channels, plus XLR and 1/4-inch jack line-outs, complete the picture. Before we get into the sounds, it's worth noting the amp's speaker combination: a 6.5-inch woofer and a 3-inch tweeter. If you're used to electric amps equipped with 12-inch Celestions, this might come as a shock, but this hi-fi configuration provides a more balanced sound that is not only ideal for wringing more bass out of your acoustic, but also means your backing tracks are represented more faithfully, too. Plug in an electro-acoustic and the SubZero 60W greets you with a clean, honest reproduction of your playing. This can be easily tweaked to your desired tone via the three-band EQ. The woofer ensures that bass frequencies come through loud and clear, giving real weight to your strumming, while boosting the treble coming out of the tweeter adds a touch of sparkle for fingerpicking. Effects-wise, the range of chorus and delay settings on offer is ideally suited to acoustic players, and offers sonic polish without dominating your sound. However, the reverb, which is fine in small doses, does tend to get a little clinical and fizzy at more intense settings. Fortunately, the phase switch is more successful, and effectively reduces feedback at higher volumes via a bass frequency cut. It's a handy feature because it can be easy to overload the woofer with too much low-end when you're really cranking the amp. The mic and auxiliary inputs work well, and with the volume available from this compact combo, you'll have no problems singing and strumming along to backing tracks across a crowded room or street. Indeed, if you can get hold of external power, this would make an ideal busker's combo for bigger outdoor performances. It's a shame, then, that the amp's reverb isn't applied to the mic channel, leaving vocals sounding a little raw in comparison with the effected guitar. This omission may also scupper any notions of using an external mic on your acoustic, since you'd need a separate reverb pedal to add ambience to your sound. While it may be petite, this combo can project your playing to a wider audience with ease, and it will let you sculpt your acoustic's tone, too. Plus, the line-out jacks mean it can function as a DI unit for a PA, or as a monitor on stage, making for one versatile little amp. 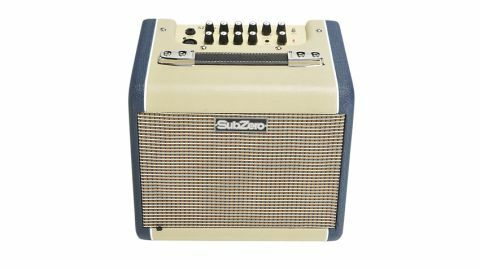 The reverb doesn't quite deliver, and the lack of mic channel effects is a tad disappointing, but for small gigs and large-scale busking, SubZero's 60-watt combo could be an acoustic troubadour's new best friend.